Don’t Look Down on Yourself? “Why do you look down on yourself who are so precious to God? Why think so little of yourself when you are so honored by him? Why do you ask how you were created, and don’t want to know why you were made? “This entire visible universe is yours to dwell in. It was for you that the light dispelled the overshadowing gloom; for you the night was regulated and the day was measured: for you the heavens were brightened with the brilliance of the sun, the moon and the stars. The earth was adorned with flowers, trees and fruit; lovely living things were created in the air, the fields, and the seas for you, lest you lose the joy of God’s creation in sad loneliness. “And the Creator is still devising things that can add to your glory. He has made you in his image that you might make the invisible Creator present on earth; he has made you his legate, so that the vast empire of the world might have the Lord’s representative. This entry was posted in Religion and tagged God the creator, Jesus Christ, Passionists, Peter Chrysologus, preacher on July 30, 2018 by vhoagland. This entry was posted in Religion on July 29, 2018 by vhoagland. For this week’s homily, please play the video below. This entry was posted in Inspiration, Motivational, Passionists, Religion, spirituality, Travel on July 28, 2018 by vhoagland. We’re creating a Mary Garden in our monastery garden these days and at the same time we’re reading the parable of the sower in our liturgy. (Matthew 13, 18-23) Today Jesus explains why the seed doesn’t produce fruit. Our world is like hard rocky soil where the seed gets chocked by thorns, where birds or the Evil One take it away. In Matthew’s gospel, Jesus is responding to the opposition he faces in his ministry as he promises God’s mercy. Even so, the Sower keeps sowing seed. Sowing the seed isn’t easy, the parable says. Creating our Mary Garden won’t be easy either. The weather these days isn’t cooperating, for one thing. Hot humid weather and sudden rainstorms are like our parable’s rocky soil and swooping birds. Some of the flowers and plants we were hoping to plant have suddenly become unavailable. But we hope the garden will be ready by the Feast of the Assumption of Mary, August 15th. The Mary Garden is not a little summer day project. Like the parable, it’s meant to teach us.. Mary Gardens appeared in 14th century Europe following the Black Death, a pandemic that caused millions to die in that part of the world. The gardens, usually found in monasteries and religious shrines, were meant to bring hope to people who feared the earth was bringing them death. The Mary Garden is a reminder of the garden described in the Book of Genesis that God created for Adam and Eve. The garden brought beauty and healing and nourishment to the representatives of humanity. As we face climate change, a changing, challenging earth, we need to reminded of what the earth gives us– a sense of beauty, medicines that heal us, food that feeds us. We need to care for it. Mary, “mother of the living,” reminds us of the promises of Jesus Christ, who brings us life. Honoring her, we’re creating a Mary Garden, which we hope to dedicate on August 15th. My mother told me as a boy years ago in Bayonne, New Jersey, there was a blessing in the water that day, and so we would go for a swim in the Newark Bay– hardly a place to go for a blessing today. I discovered later that August 15 was the day for blessing medicinal herbs in Europe. People would bring medicinal herbs from their gardens to the water of the sea, to holy wells, to the baptistery of the church for blessing. Afterwards, they would place a sprig of the blessed herb over the bed of the last born child. God brings life to us through the earth. A good custom to revive? I think so, but keep away from the Newark Bay. This entry was posted in Religion on July 27, 2018 by vhoagland. Yesterday’s Feast of Saints Ann and Joachim, the parents of Mary, the mother of Jesus, July 26, reminds us of the role parents and grandparents play in raising children. A few years ago I visited the ancient ruins of the temple in Jerusalem from the time of Jesus and Jewish women were fervently praying with their daughters before the temple’s western wall. They were probably praying the psalms. Ann and her daughter Mary must have prayed here too. 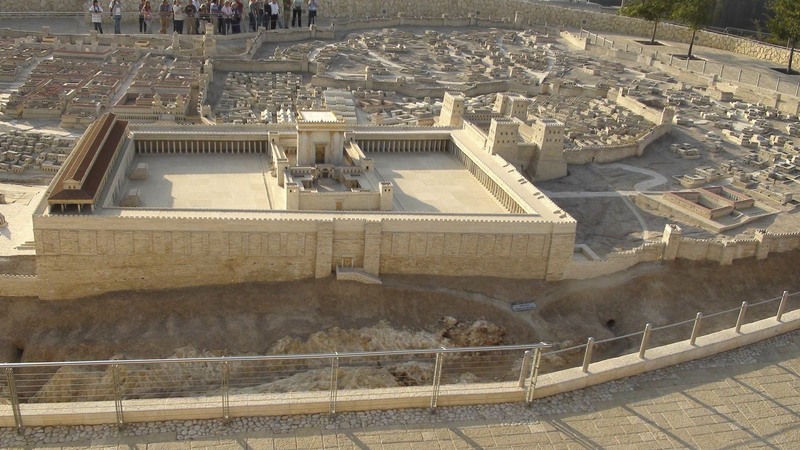 The picture above is a model of the temple from Jesus’ time at the Israel Museum. 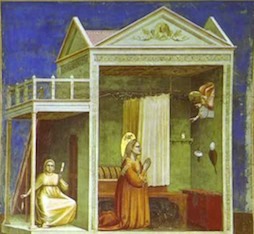 Tradition says Ann and Joachim were closely connected to the temple and may have lived nearby. A church honoring St. Ann stands today near the Pool of Bethesda, where a paralyzed man was healed by Jesus. (John 5, 1-18) The church (below) and the remains of the pool are to the right of the temple. 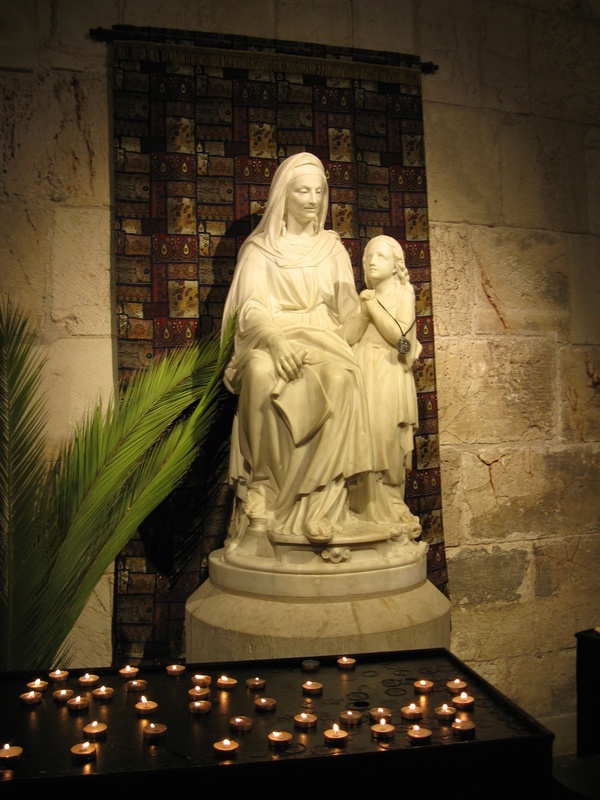 A statue of Ann and her daughter Mary, common in many Catholic churches, can be found in the Jerusalem church. Ann is teaching her daughter at her side. What is she teaching her? Some statues I’ve seen show her teaching Mary the scriptures. I’ve seen a statue showing Ann teaching her the ABCs and numbers. (below)That’s what parents and grandparents do: they teach children life’s basics: how to live and how to pray. It’s still the same today. Parents and grandparents, the next generation is at your side. Ann and Joachim pray for us; show us the way. This entry was posted in Religion and tagged Ann, Jerusalem, Jewish women, Mary, Passionists, prayer, Temple on July 27, 2018 by vhoagland. In this Thursday’s Gospel (Mt 13: 10-17) our Lord is asked by His disciples why He speaks to the crowds in parables. I used to think that in this passage Jesus sounds almost disdainful as He talks of those who “look, but do not see and hear but do not listen or understand.” They do not seem to deserve the healing that in Isaiah’s prophesy God refuses to give them. I think of the harsh sermons that I remember hearing fearfully when I was a child and went to church. We are so undeserving. My wife Berta always tells me that the Passion of our Lord was taking place within Him throughout all His ministry. Jesus must have felt great sorrow as He went about trying to reach the people. They seem to want the miracle and the spectacle, but the message of Salvation and eternal life was beyond them. The Sermon on the Mount was too much for them to understand or accept. Things have not changed. In our modern world what can we followers of Christ tell others that will open their eyes, their understanding, their hearts? Look at Jesus’ frustration in the Gospel. Can we do any better? I used to think that in Thursday’s Gospel Jesus is saying that He talks to the unbelievers through parables in order to confuse, insult, and reject them. I can’t believe that anymore. In his book “Jesus, a Pilgrimage,” Fr. James Martin says that parables were ways to reach the people through the things they understood: farm life, fishing, home-building, the nature surrounding them, human relations. Jesus must have known that so much of His teaching was beyond their understanding. Perhaps the stories and similes were meant to catch their attention and stimulate their imaginations, like seeds planted hopefully in the soil of their hearts, whether rocky, compacted, weed-ridden, obstinate, or uninterested. Were the chosen disciples so much better off than these crowds? Yes, Jesus gave them a good amount of healing and knowledge. For His own divine reasons He had also put into their hearts the supernatural gift of faith. But did they really comprehend the vast mystery of God’s Glory and Love? They certainly had a long painful road ahead in order to achieve enough joy and understanding of who Jesus really was in order to become truly committed to the demands of discipleship. When I sit at Mass I feel like a member of both the undeserving crowd and the circle of disciples. When I hear the modern parables of the priests’ homilies, do I have ears to listen to what God is telling me? When I look around, do I have the eyes to see the presence of the living God in the people that surround me? When the broken, wounded Host is raised before me (“Behold the Lamb of God, Behold Him…”) is my heart pure enough that I might truly see Him, the Eternal God? Lord, You are such a mystery to me. Sometimes my link to You seems so tenuous. And yet Your gift of faith has been planted in my heart. I do not want to let You go. Please don’t let me go. But, most importantly, I beg You, have mercy on those unbelieving “crowds.” Touch their hearts, show them who You are! This entry was posted in contemplation, Inspiration on July 26, 2018 by vhoagland. We celebrate the Feast of Ann and Joachim today, parents of Mary, the Mother of Jesus. There is an early 2nd century document called the Gospel of James that tells their story,but there’s nothing in the scriptures about them. I’ll use that early document as a basis to tell their story. Ann and Joachim lived in Jerusalem, tradition says, where Joachim, a descendant of David and a wealthy man, provided sheep and other offerings for the temple sacrifices. The two had ties to Bethlehem nearby and Nazareth in Galilee. They were well off but for twenty years one disappointment clouded their marriage: they had no child. Even after vowing to dedicate their child to God, no child came. And so, at a time when children were especially treasured, they were thought poor. Descendants of David, they were blamed also for failing to continue the line the Messiah would come from. Stung by criticism, Joachim spent more time in the mountains, brooding among the shepherds and the sheep. As her husband distanced himself from her, Ann too felt the sadness of childlessness. God seemed far away. When she was three years old, Ann brought Mary to the temple where she learned to read the scriptures, to pray and take part in the Jewish feasts celebrated through the year. She watched her father bring lambs to be offered in sacrifice. She grew in wisdom and grace in the presence of God. When Mary approached marriage age– then 15 or so–her parent arranged for her marriage as it was the custom. They sought the high priest’s advice, tradition says, and Joseph of Nazareth was chosen as her husband. At the time, Ann and Joachim made Nazareth their home. During this time the angel Gabriel appeared to Mary and announced that she was to be the Mother of Jesus. By the power of the Holy Spirit she conceived the Child. After Jesus was born in Bethlehem, Mary and Joseph returned to Nazareth where Jesus would grow up. He was raised him in a large extended family that included his grandparents, Ann and Joachim, who cared for him as a child. No one knows just when or where Ann and Joachim died, but Jesus must have treasured them in life and on their passage to God. My retelling of the story of Ann and Joachim is based on the 2nd century Protoevangelium of James–an apostle related to Jesus. The story repeats a fundamental theme of the Book of Genesis: God promises Adam and Eve many children who will enjoy the blessings of the earth. God repeats the promise to an aged, childless couple, Abraham and Sarah, and again to Anna, who bemoans her childlessness to the priest Eli in the temple. In the same way, God gives a child to Ann and Joachim. Mary, their daughter, will bring blessings to the nations through her son Jesus Christ, born of the Holy Spirit. 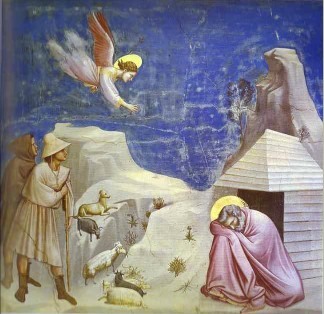 Giotto’s illustrations (above) from the Arena Chapel in Padua. 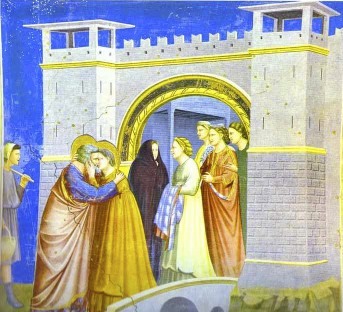 helped popularize the story of Ann and Joachim in Italy, Europe and the rest of the western world from the 14th century. Grandmothers and grandfathers appreciate this story. Like Ann and Joachim they have a big role raising the next generation. This entry was posted in Religion and tagged childhood of Mary, Feast of Ann and Joachim, grandparents, Jesus Christ, Mary, novena to St. Ann, Passionists, Protoevangelium of James on July 26, 2018 by vhoagland.